Movis by Lush is a wheaty, squidgy facial wash bar that was created to help exfoliate, revive and soften the skin without stripping it of its natural oils. Aesthetically it is designed to look like a loaf of bread (if you couldn’t guess from the pun-based name), but the soap actually also contains wholemeal bread as an exfoliator. 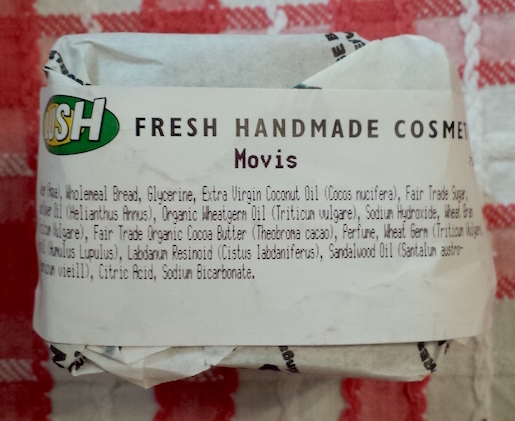 In addition to wholemeal bread, Movis also includes Fair Trade organic cocoa butter, wheatgerm oil, extra virgin coconut oil and hop oil. It is inspired by Lush co-founder Mo Constantine's love of baking and soap alchemy and it contains no petrochemicals, animal fats, palm oil or SLS and it isn’t tested on animals. 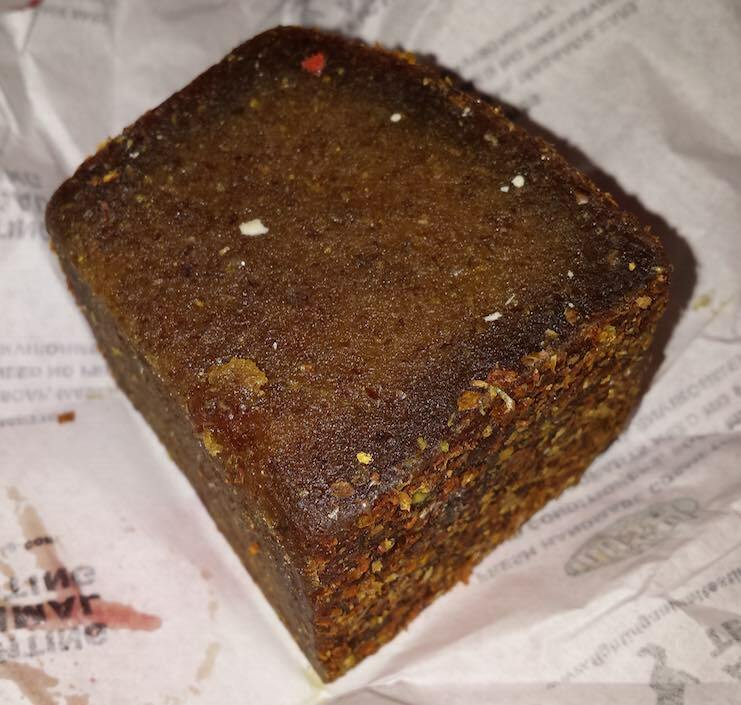 It has a bizarre, doughy texture, a bit like a very rich cake more than bread (which is understandable as real bread would just turn soggy), but you can really appreciate the effort and thought that has gone into designing this soap. It's pretty clever and maybe a little gimmicky to some, but I like the idea! "Wholemeal bread also contains vitamins and minerals such as zinc, which is said to help skin heal and grow, and niacin, a B-vitamin thought to be needed for healthy hair and skin." The part that particularly sparked my interest is the mention of zinc and healing properties due to my current outbreak of perioral dermatitis. Instead of going into detail here though I have updated my Treating Perioral Dermatitis post with information about Movis specifically related to that issue and I have discussed use on skin with dry patches in this review. As with all solid Lush products (such as bar body soaps and face soaps), I personally prefer cutting a chunk off before use. This way it doesn't all get wet at once and begin to disappear or ruin. As soon as one piece is finished, it’s easy to just cut off another chunk to start again. The soap lasts much longer this way and you don’t have to hold a big bulky chunk (depending on how much your purchase) to wash your face either. To use you need to wet the bar and rub it onto damp skin. Alternatively, you can rub the bar in your hands to collect product on your fingers or palms to then apply to the skin. You then need to massage into the face and rinse. When applying the soap I found that it can feel as if you are using a bit more than you truly are. I tend to apply until I feel that the face is sufficiently covered and it is easy enough to massage into the skin, but at first it did feel a bit like I was using too much. When looking back at how little I've actually used though, it's clear that it isn't the case. The soap doesn't lather up into a foam, staying creamy instead. This may also contribute to the feeling of using a lot of it at once. The smell is quite sweet rather than bread-y and it isn’t overwhelming. During washing you get some brown 'crumbs' (I say this because of the bread thing we have going on here) on your face. 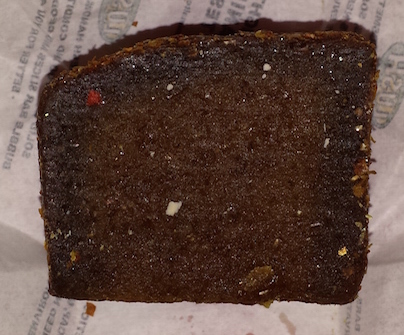 From what I can gather, these actually are the crumbs of wholemeal bread that are included in the soap. Movis exfoliates gently and I find it to be incredibly softening. The areas of dry skin that I have been battling recently are far more moisturised and easier to deal with. Other than the dry patches on my skin at the moment, my skin type is oily. Movis doesn’t make oiliness worse, so you don’t need to worry about it causing the skin to look greasy. Therefore, I would say that it is suitable for all skin types, but particularly those that are either dry or that have small dry areas. In fact, the best word that I can come up with to describe Movis is ‘balancing’. It helps to provide moisture where needed and doesn’t aggravate oilier areas. Some people have even reported on the Lush website (see reviews) that it has been helping them with breakouts too. Overall, I’m a big fan of Movis. It has been helping me a lot and it is a facial wash that I highly recommend. Skin is left cleansed and soft and areas of irritation are left feeling more comfortable. You can purchase 100g of Movis for £4.50 from Lush, but depending on how much you want to buy the price will vary. What are your thoughts on Movis by Lush? What's your favourite Lush product?